Posted on Sun, Jan 15, 2012 : 1:03 p.m. Calling all chili cooks, the 21st annual Cavanaugh Lake Chili Cook-Off is looking for the best chili maker around - and there are cash prizes, trophies and bragging rights for the winners. The cook-off will be held in conjunction with the 40th annual Winter Carnival, which takes place Feb. 3-5 and is hosted by the American Legion Post 31, on 1700 Ridge Road in Sylvan Township. The three-day carnival kicks off with a euchre tournament for those over 18 years old, at 7 p.m. Feb. 3. There’s a $5 fee and last year, there were 88 players, said Jeff Vogel, who runs the tournament. On Saturday, Feb. 4, breakfast is served from 7 a.m. to noon, and provided the lake is frozen, there will be a fishing derby from 7 a.m. until 5:30 p.m. Only once, Vogel said, has the fishing derby been canceled because Cavanaugh Lake hadn’t frozen over. The chili cook-off contestants begin prepping their creations at 10 a.m. Due to space available, the cook-off is limited to just 13 teams and there is a $25 entry fee per team. It is a “renegade” competition, which means anything goes, but it must be cooked on site. Here's an Entry Form 2012-2.pdf. Last year, the event had nine contestants, said Larry Doll, chairman of the event, who recommends that chili cooks get their entry forms in early. Jan. 30 is the deadline. Each cook must provide their own stoves, all cooking equipment and utensils. Plus, meat must be commercially purchased in the State of Michigan. 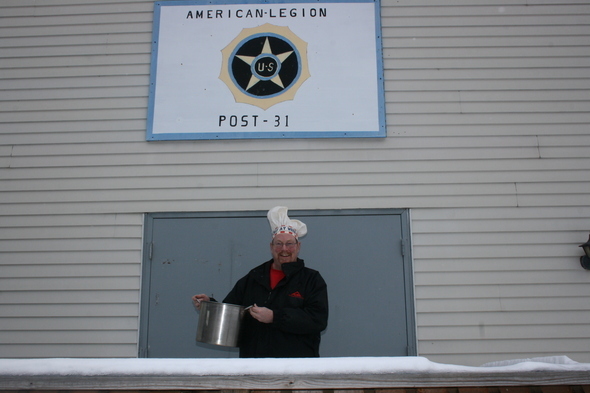 The cook-off is organized by the Son’s of the American Legion Squadron 31. Doll said stoves are lit at 11 a.m., and participants have three hours to cook their chili. At 2 p.m. samples are submitted to the judges, and the remaining chili goes on sale to visitors for tasting and to select the People’s Choice winner, Doll said. More 900 of the 50 cent tickets were sold previously. In 2011, the People’s Choice award and “local bragging rights” was awarded to Brian Edick and Tony Robards of Chelsea. Chris Thompson from Westland took first place trophy and a $50 cash prize for the best chili. Second place, a trophy and $35, went to Sue Collins of Chelsea, and the third place went to Tina Sanderlin of Southgate, who won $25 and a trophy. Saturday evening, beginning at 7:30 p.m., Star 69, a rock and roll band, will begin playing. Weather permitting, the fishing derby continues on Sunday at 7 a.m. and concludes at 1:30 p.m., Vogel said. Also from 7 a.m.-noon, breakfast will be served. The Winter Carnival is an annual fundraiser for the legion, which supports many events in the community including flags for veterans’ graves in all area cemeteries as well as offering Military Honors at Veteran’s funeral services.